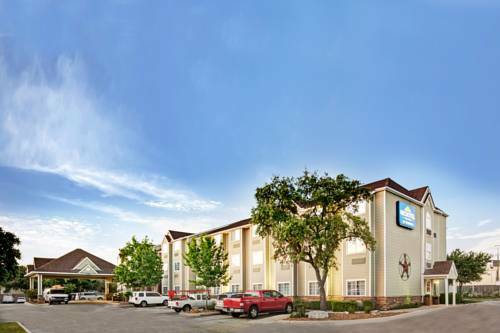 Just five miles from the San Antonio Airport, this Microtel Inn and Suites by Wyndham San Antonio Airport North is also convenient to restaurants, Loop 410 and Highway 1604. Shop at the nearby mall, take the family to Morgans Wonderland Amusement Park or Six Flags Fiesta Texas, catch a game at the ATT Center, or visit the San Antonio Riverwalk, all close to this hotel. Stay active with the jogging track, complimentary passes to nearby fitness center, and outdoor pool, and cook a meal in the barbecue area. Begin each day with the complimentary continental breakfast and enjoy complimentary wireless Internet all day long. This hotel offers dry cleaning, ample large-vehicle parking and a business center with computer access, meeting rooms, and copy, print and fax service. Modern guest rooms feature hair dryer and flat-screen TV, and suites with hot tubs are available.